The Senate and the House of Representatives are expected to start the official tally of votes for the presidential and vice presidential candidates by next week. The Speaker of the House, Feliciano Belmonte Jr. said that the lawmakers will try to conduct a speedy canvass since they are bound to proclaim the winners prior to June 10, which is the closing of the 16th Congress. Speaker Belmonte and Senate President Franklin Drilon will preside over the joint session, when the joint chambers of the governement will act as a canvassing board. 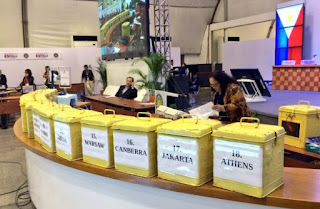 Coming from the Senate, all ballot boxes containing the Certificates of Canvass (COCs) and election returns will then have to be transported physically to the House of Representatives on May 24, according to Senate secretary Oscar Yabes. Although Drilon and Belmonte promised a congressional count that is as fast as possible, House Majority Leader Neptali Gonzales II foresees that the canvassing might be slowed down by the tight race between VP candidates Ferdinand "Bongbong" Marcos, Jr. and Leni Robredo. Gonzales said that lawyers and supporters of Marcos and Robredo are expected to scrutinize each COC. Thus, there will be objections from both sides which would cause some delay in the canvassing. Marcos has been very vocal about his objections to the unofficial vote counts of the Parish Pastoral Council for Responsible Voting (PPCRV) and COMELEC. His camp has been asking both bodies to stop the count a day after the elections on May 9, when about 90.99% of votes were tallied. Robredo trailed by as much as a million votes early on in the counting but overtook Marcos by 3 a.m. Tuesday. The PPCRV ended its "quick count" of the 2016 national and local elections on May 18 with votes from 96.14% of the precincts counted. Robredo garnered a total of 14,023,093 votes while Marcos got 13, 803, 966 votes. Leni led the vice presidential race by a very slim margin of 219,127 votes. Just like what happened in the unofficial vote count, all eyes and ears will again be glued on the official vote count or canvassing of the vice presidential race.